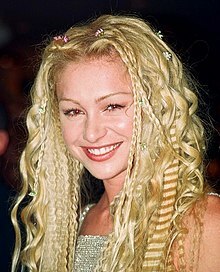 Portia Lee James DeGeneres (born Amanda Lee Rogers; 31 January 1973), known professionally as Portia de Rossi, is an Australian-American model, philanthropist, and actress. She is best known for starring as Nelle Porter on the American drama series Ally McBeal (1998–2002), for which she won a Screen Actors Guild Award, as Lindsay Bluth Fünke on the American television sitcom Arrested Development (2003–2006, 2013, 2018-2019), and as Elizabeth North on the American political thriller series Scandal (2014–2017). She also portrayed Olivia Lord on the American television drama series Nip/Tuck (2007–2009), and Veronica Palmer on the American television sitcom Better Off Ted (2009–2010). De Rossi is married to comedian, actress and television host Ellen DeGeneres. Portia de Rossi, born Amanda Lee Rogers in Horsham, Victoria, Australia, is the daughter of Margaret, a medical receptionist, and Barry Rogers. Her father died when she was nine years old. She grew up in Grovedale, a suburb of Geelong, Victoria, and modelled for print and TV commercials as a child. In 1988, at age 15, Rogers adopted the name Portia de Rossi, by which she remains best known. In 2005, she explained she had intended to reinvent herself, using the given name of Portia, a character from William Shakespeare's The Merchant of Venice, and an Italian last name. She was educated at Melbourne Girls Grammar School and the University of Melbourne, where she studied law. De Rossi's first significant role was as a young and impressionable model in the Australian 1994 film Sirens. Soon afterward, she moved to Los Angeles and won guest roles on several TV shows and a permanent role in Nick Freno: Licensed Teacher, before landing a part in the film Scream 2. During time in the United States, de Rossi worked diligently to drop her Australian accent. De Rossi garnered international attention when she joined the main cast of Ally McBeal in 1998, playing lawyer Nelle Porter. She remained with the show until its end in 2002. In 2001, she starred in Who Is Cletis Tout? alongside Christian Slater. From 2003–06, de Rossi starred as Lindsay Bluth Fünke on Fox Television's Arrested Development. She next portrayed John F. Kennedy, Jr.'s wife, Carolyn Bessette-Kennedy, in the made-for-TV movie America's Prince: The John F. Kennedy Jr. Story in 2003. That same year, she portrayed an Australian reporter who inspires a protest against Frank Sinatra during a concert tour in The Night We Called It a Day. In 2005 de Rossi portrayed Zela, a fortune-teller, in the Wes Craven thriller Cursed. From 2007–2008, de Rossi appeared in Nip/Tuck's fifth season as Julia McNamara's girlfriend, Olivia Lord. In 2009 and 2010, de Rossi played the high-strung and controlling Veronica Palmer on the ABC show Better Off Ted. In 2011, she appeared in Better Off Ted cast member Malcolm Barrett's music video for "Revenge of the Nerds," spoofing her character of Veronica in a cameo alongside other cast members of the cancelled series. She ranked 69th in Stuff Magazine's 100 Sexiest Women, 31 in Femme Fatales' Sexiest Women of 2003 list, and 24 in Maxim's 100 Sexiest Women List in 2004; in late 2006, the magazine Blender listed her as one of the hottest women of film and TV. In May of 2007, she was featured as one of 100 Most Beautiful in a People special edition. TV Guide included her and Ellen DeGeneres in their Power A-List couples in 2007. In February 2012, it was announced that ABC had ordered a pilot for a new drama series The Smart One, one of whose executive producers was listed as Ellen DeGenere-s, and which featured de Rossi in a leading role. The actress was to star as a "brilliant and successful woman who begrudgingly goes to work for her less-brainy but more popular sister – a former beauty queen, weather girl and now big-city Mayor." But The Smart One was not picked up for the 2012-13 season. Six years after the series was canceled by Fox, filming for a revived fourth season of Arrested Development began on 7 August 2012, and de Rossi reprised her role as Lindsay Bluth Fünke. This fourth season consisted of 15 new episodes, which debuted at the same time on Netflix on 26 May 2013. Each episode focused on one particular character, with de Rossi's Lindsay featured in Episode 3, "Indian Takers," and Episode 8, "Red Hairing," and also appearing in several other episodes of the season. In July 2014, ABC confirmed that de Rossi was joining season 4 of Scandal, in the role of Elizabeth North. De Rossi joined Scandal in the fourth season in a recurring role, before being upped to a series regular for the fifth season. In April 2017, in season six, de Rossi's character, Elizabeth North, was killed off by a golf club attack. De Rossi herself made the decision to depart the Scandal series, saying, "I am incredibly grateful for my time here at Scandal. I will miss playing Elizabeth North but I've made the decision to focus on a business opportunity. Shonda, Betsy and the cast have been incredibly supportive of my decision. I will always love my Scandal family. I'll be watching!" Creator Shonda Rhimes added, "I have been a fan of Portia's for years and it was an honor to have her join our Scandal family." In May 2018, de Rossi announced on The Ellen DeGeneres Show that she would be retiring from acting, though she later elaborated that she would make an exception for future seasons of Arrested Development. De Rossi was married to documentary film-maker Mel Metcalfe, from 1996 to 1999, initially part of a plan to get a green card, though she did not go through with the plan. She said about the marriage that "it just obviously wasn't right for me." In a 2010 interview on Good Morning America, she explained that as a young actress, she was fearful of being exposed as a lesbian. From 2001 to 2004, de Rossi dated director Francesca Gregorini, the daughter of Barbara Bach and the stepdaughter of Ringo Starr. She said that most of her family and Ally McBeal castmates did not know she was a lesbian until tabloid pictures of the couple were published. She declined to publicly discuss the relationship or her sexual orientation at the time. De Rossi and Gregorini broke up in late 2004 because de Rossi began dating DeGeneres, whom she met backstage at an awards show. In 2005, she opened up publicly about her sexual orientation in interviews with Details and The Advocate. She and DeGeneres became engaged when DeGeneres proposed in 2008. They were married at their Beverly Hills home on 16 August 2008, witnessed by their mothers and 17 other guests. On 6 August 2010, Portia filed a petition to legally change her name to Portia Lee James DeGeneres. The petition was granted on 23 September 2010. She became a United States citizen in September 2011. In 2010, de Rossi published her autobiography, titled Unbearable Lightness: A Story of Loss and Gain, within which she wrote about the turmoil that she had experienced in her life, including suffering from anorexia nervosa and bulimia and being misdiagnosed with lupus. She had struggled with the eating disorders for four years while filming Ally McBeal. To promote the book, she appeared on The Oprah Winfrey Show and The Ellen DeGeneres Show. In 2013, when interviewed about rumors of pregnancy, de Rossi stated that she and DeGeneres were not planning to have children. DeGeneres and de Rossi both became vegans in 2008, though DeGeneres recently stated that she is no longer vegan. They have adopted several rescue animals. In 2017, de Rossi tweeted that actor Steven Seagal exposed himself to her while she was auditioning for one of his films. De Rossi supports a variety of charitable organizations, including Locks of Love, a group that provides human hair wigs (made from donated ponytails) either free of charge or on a sliding scale based on their own guidelines for children with alopecia and other medical conditions that cause hair loss, such as chemotherapy for certain types of cancer. She has also supported fundraising efforts for FXB International, an African AIDS relief organization, and The Art of Elysium, an art foundation for terminally ill children. An avid animal lover, de Rossi also supports Alley Cat Allies, an organization dedicated to protecting and improving the lives of cats. De Rossi and DeGeneres are strong supporters of The Gentle Barn, a California sanctuary for abused animals. 1997 Veronica's Closet Carolyn Episode: "Veronica's First Date"
2002 The Twilight Zone Laurel Janus Episode: "Dead Man's Eyes"
2003 Mister Sterling Lauren Barnes 2 episodes: "Wish List" and "Final Passage"
2014 Sean Saves the World Jill Episode: "The Joy of Ex"
2017 Santa Clarita Diet Dr. Wolf 2 episodes: "The Book!" and "Baka, Bile and Baseball Bats"
2017 Family Guy Bonnie Swanson (prank call voice) Episode: "A House Full of Peters"
^ Samantha Highfill (23 July 2014). "Portia de Rossi joins season 4 of 'Scandal'". Ew.com. Retrieved 3 March 2017. ^ a b Wagmeister, Elizabeth (21 April 2017). "'Scandal' Star, Shonda Rhimes React to Major Death (SPOILERS)". ^ "Celebrity Bios: Portia de Rossi". Us Magazine. Retrieved 28 January 2009. ^ "Geelong's Portia Marries Ellen". Geelong Advertiser. 18 August 2008. Retrieved 28 January 2009. ^ London Academy of Media and Film TV. "Australian Actress: Portia de Rossi". Archived from the original on 1 March 2013. Retrieved 24 July 2012. ^ "Portia de Rossi profile". Filmreference.com. Retrieved 12 July 2010. ^ "Portia de Rossi on Ellen". Youtube. Retrieved 11 December 2011. ^ a b c Kort, Michele (29 August 2005). "Portia heart & soul". The Advocate. Here Media. Archived from the original on 26 May 2015. Retrieved 19 August 2015. ^ "The Very Private Portia". The Age. Melbourne. 10 May 2010. ^ "Better Off Ted cast reunites for Malcolm Barrett's hip-hop video". Zap2It.com. Archived from the original on 10 January 2012. Retrieved 16 November 2011. ^ Errico, Mike (1 January 2007). "Hottest Women of...Film and TV!". Archived from the original on 16 May 2007. ^ "ABC to air Ellen DeGeneres and Portia de Rossi's "The Smart One"". Unreality TV. 6 February 2012. Archived from the original on 6 February 2012. Retrieved 6 February 2012. ^ Johns, Nikara (23 July 2014). "Portia de Rossi Joins 'Scandal' in 'Top Secret Arc'". Variety. Retrieved 24 July 2014. ^ Olivia Katrandjian (3 November 2010). "Portia de Rossi: 'I Would Starve Myself Daily'". ABC News. Retrieved 3 November 2010. ^ Johnson, Zach (26 January 2012). "Ellen DeGeneres and Portia de Rossi's Road to Romance". Us Weekly. ^ Singh, Anita (18 August 2008). "Television presenter Ellen DeGeneres marries lesbian lover Portia de Rossi". The Daily Telegraph. London. Retrieved 22 May 2010. ^ TMZ Staff. "Portia to Ellen: I Want to Be a DeGeneres!". TMZ. Retrieved 11 August 2010. ^ "Portia de Rossi takes wife Ellen DeGeneres' name". USA Today. 23 September 2010. ^ "Portia Becomes a U.S. Citizen!". Ellen.warnerbros.com. Retrieved 16 February 2015. ^ de Rossi, Portia (November 2010). Unbearable Lightness: A Story of Loss and Gain. Atria. ISBN 1-4391-7778-3. ^ Van Meter, Jonathan. "Disappearing Act: How did Portia de Rossi withstand the pressures of Hollywood". Vogue. Archived from the original on 1 April 2006. Retrieved 22 March 2009. ^ Freydkin, Donna (13 November 2007). "Portia de Rossi nips at new TV challenges". USA Today. ^ Marcus, Stephanie (24 October 2011). "Ellen DeGeneres And Portia de Rossi Don't Want Children". Huffingtonpost.com. Retrieved 16 February 2015. ^ Juliette Steen. "Famous Vegans And Vegetarians (Some Of These Celebrities Might Surprise You)". Huffingtonpost.com.au. Retrieved 3 March 2017. ^ Gilchrest, Tracy E. (8 November 2017). "Portia de Rossi: Steven Seagal Sexually Harassed Me During an Audition". The Advocate. ^ "Portia de Rossi accuses Steven Seagal of sexual harassment". BBC. 9 November 2017. ^ "Locks of Love". Locks of Love. Retrieved 12 July 2010. ^ "Charity Review of Locks of Love". Charityreports.give.org. Archived from the original on 7 March 2007. Retrieved 12 July 2010. ^ "BBB review of Locks of Love". Bbb.org. Retrieved 12 July 2010. ^ "Locks of Love FAQ". Locksoflove.org. Retrieved 12 July 2010. ^ "Portia de Rossi Helps FXB to Rebuild Uganda". Celebrity Halo. July 2006. Retrieved 29 December 2008. ^ "Portia de Rossi supports The Art of Elysium". Celebrity Halo. January 2008. Retrieved 29 December 2008. ^ "I'm an Alley Cat Ally – Portia de Rossi". Archived from the original on 20 November 2010. Retrieved 29 September 2010. ^ "Alley Cat Allies – About Us". Archived from the original on 23 May 2009. Retrieved 29 September 2010. ^ "The Gentle Barn". gentlebarn.org. Retrieved 8 March 2012. ^ "About the Cast of THE SHIFT (2009) - movie starring Dr. Wayne Dyer". Dyermovie.com. Archived from the original on 22 February 2014. Retrieved 16 February 2015. ^ Michael Ausiello. "'Scandal' Season 5 Cast: Portia de Ross a Series Regular, Liz Chief of Staff – TVLine". TVLine. Retrieved 29 August 2015.